Have you Heard? DraftKings is holding another $100,000 Free Fantasy Football Contest….. The results from Week One of the 2015 NFL Season were so good for DraftKings, they decided to give back! This Free Roll was played on Sept. 20th, the offer is over. Yes, they are in a giving mood….take advantage while the Free Rolls are available!!!!! 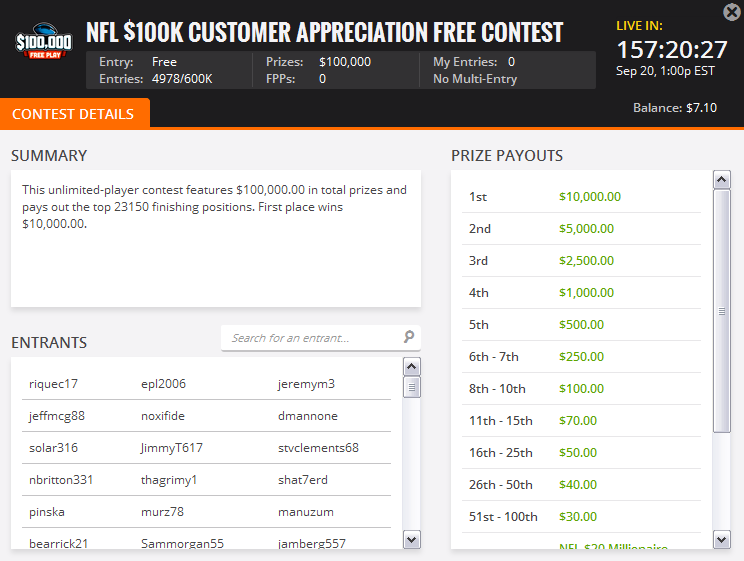 No other DFS is giving away Money like DraftKings is….. In Appreciation to all their New and Existing Customers, a $100,000 Free Roll, for everyone, is set up and open to everyone who wants a crack at some free fantasy money on Week Two of the NFL season………..
Click here to sign up on DraftKings and get started!!!! There is a limit of one entry per player, everyone has a fair chance at winning the $10K in DK Dollars for finishing first…..All winners on the Customer Appreciation Free Roll will be paid in DK Dollars or tickets to upcoming contests. DK Dollars can be used to enter any paid DraftKings Fantasy Contest, but cannot be withdrawn until you accumulate cash winnings from entries used with your DK dollars. If you join Draft Kings and sign-up to the $100K Free Roll, you could be one of the 23,150 free roll winners. 1st place pays $10K in DK Dollars, 2nd place gets $5K in DK Dollars. All in all, the top 100 finisher’s will win up to $10k in DK Dollars. The next 100 finishers will get a $20 entry to a Millionaire Maker. The next 1000 finishers will win a $9 contest ticket. The next 22K finishers will get a $3 voucher to any $3 Fantasy Contest they choose…. $3 contests are the Highlighted Contests each week! In total, there will be 23,150 winners, totaling $100,000 in DK Dollars and Contest tickets. Why wouldn’t you give it a whirl????? You’ll also get an Extra Free $3 ticket to play any real money contest of your choice………..
Are your Dreams big enough to Cash that Check? Play for the Glory, Play for the Giant Check, Welcome to the Big Time…. « Did you see the 30 Minute DraftKings.com program?